This is the result of one of those spontaneously inspired moments and... (more accurately) that time of the month when it's impossible to go to sleep without having something chocolate. Twas last Friday evening on the way home from work when I spent a good part of the train ride trying to think of the easiest and fastest way to make myself some chocolaty baked good. I was tired but desperate. The next day was going to be spent having fun at Najah's so I had to squeeze in some productive kitchen time the same night. If you're wondering what about Sunday, it was intended to be the day to do absolutely nothing - which turned out not as planned, as you will soon find out. The brownies came to mind but it has been done so many times I didn't want it to lose its luster. Browsing the (growing) recipe bookmarks on my phone, I stumbled on this. Perfect! Simple and requiring mostly pantry staple ingredients. A prompt buzzing through the supermarket got me a bottle of root beer and a packet of beautiful Rainier cherries. Home and an hour later I was staring at an army of 22 cupcakes, willing myself not to eat any of them, no matter how many times each one was calling my name. I wanted to bring some to Najah's but didn't want to waste time with the whole whipped cream and ice cream business at her place (since I really am supposed to bake her husband a light and fruity belated birthday pavlova and not stuff them with more chocolate). The Swiss buttercream frosting seemed like a good solution so while the army of evil-looking poofs were cooling off there was a good 15 minutes worth of high-speed beating with the Kitchenaid. 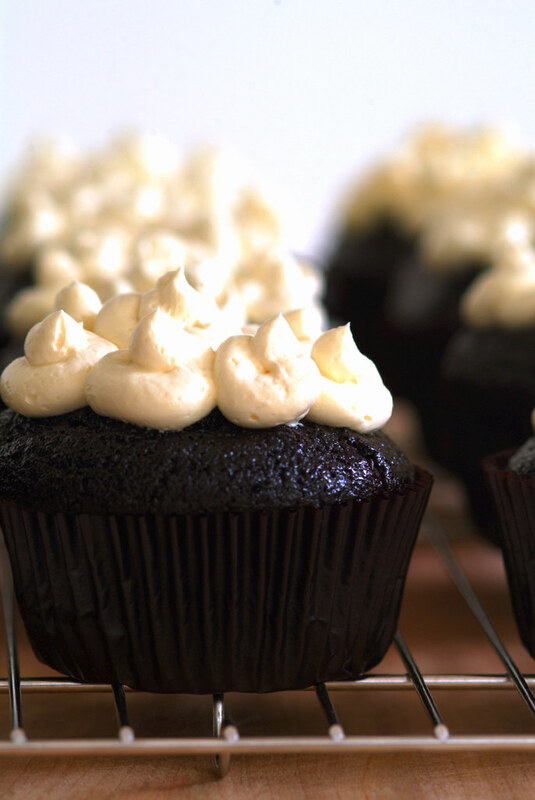 A round of haphazard piping produced a dozen dressed up off-white topped dark brown heavenly looking goodness, at that point I was too afraid to stay in the kitchen any longer. 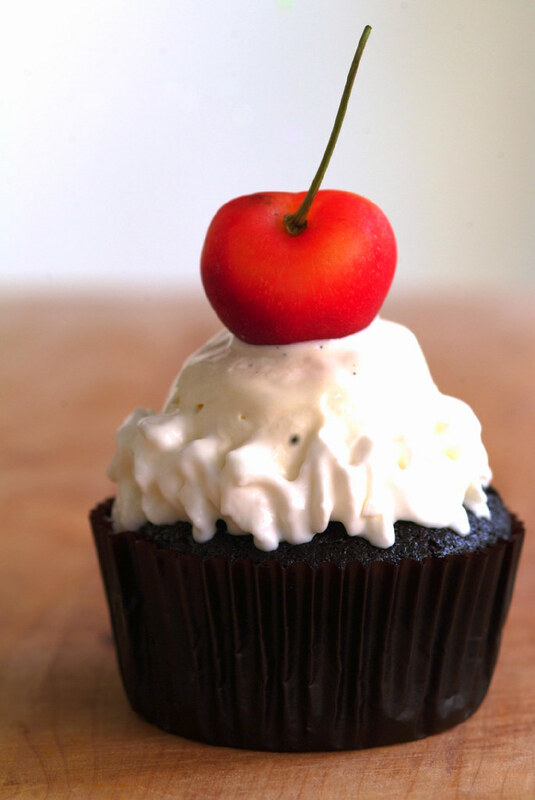 One cherry popped onto a selected cupcake for testing out how the final product would look like. After a quick iPhone pic and informing Najah her pavlova had effectively changed into something totally unrelated, I was off to bed. The next morning when the time came for brunch, one cupcake without the frosting made it into Vijay's mouth before he left for work. "Is it dry?" (Not that I'd doubt any of Deb's tried and tested items but I was worried I might have over-baked them.) "Nope. Very nice, can taste the root beer leh..." The entire cupcake disappeared in less then a minute (and, no he did not share). The rest of the Saturday was full of food (ah but then?) and priceless moments catching up. After Najah's nasi lemak with prawn sambal (yum), the cupcakes came out. Idris finished his with a cup of babyccino and we each slowly savored ours with hot lattes. After a momentary state of high from the chocolate and root beer, I almost fell asleep on her couch. Thank God for the teh tarik session with keropok lekor and fried cempedak later. Sunday came and instead of sleeping in I rose early with a mission - to assemble the actual floats. Still quite sleepy and feeling too lazy to beat the cream by hand, I ended up with a bowl of butter off the stand mixer. After (quite a) few mildly mumbled expletives and cleaning up the buttery mess, I managed to put a couple of floaty ones together with a canister of ready-whipped cream from the fridge. Note to self: no more whipping cream with the machine, period. Seriously, I don't know what got into me that day. 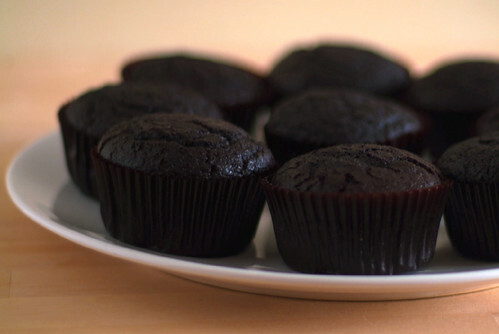 Make the root beer cupcakes: Preheat oven to 350°F. Line 22 cupcake cups with paper liners. In a small saucepan, heat the root beer, cocoa powder and butter over medium heat until the butter is melted. Add the sugars and whisk until dissolved. Remove from heat and let cool. In a large bowl, whisk flour, baking soda, and salt together. In a small bowl, whisk the eggs until just beaten then whisk them into the cooled cocoa mixture until combined. Fold the liquid and flour mixtures together in the large bowl. The batter will be slightly lumpy; this is okay. If you overbeat it, it will get tough. 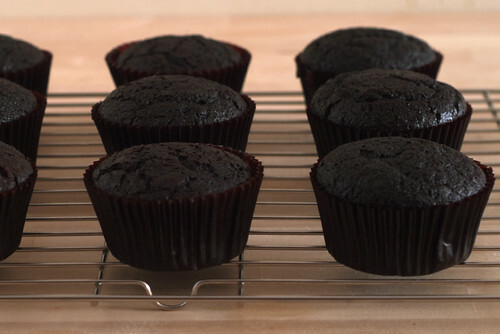 Fill cupcake liners about 2/3 to 3/4 full (a 1/4 cup scoop or measuring cup will filled mine perfectly) and bake cupcakes, rotating trays back to front and top to bottom halfway through, until a tester inserted into the center of each comes out clean, about 17 minutes. Transfer pan to a wire rack to cool completely. 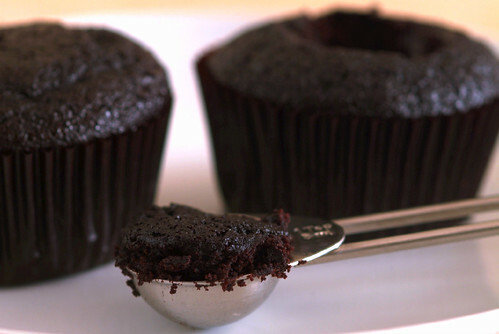 Use the tip of a knife to cut a small cone of cake out of the top center of each cupcake (I used a measurement spoon and the scooped out bits when straight to my mouth). Using a spoon or a small cookie scoop, nest a scoop of ice cream in each indent. Surround ice cream with dollops of whipped cream. 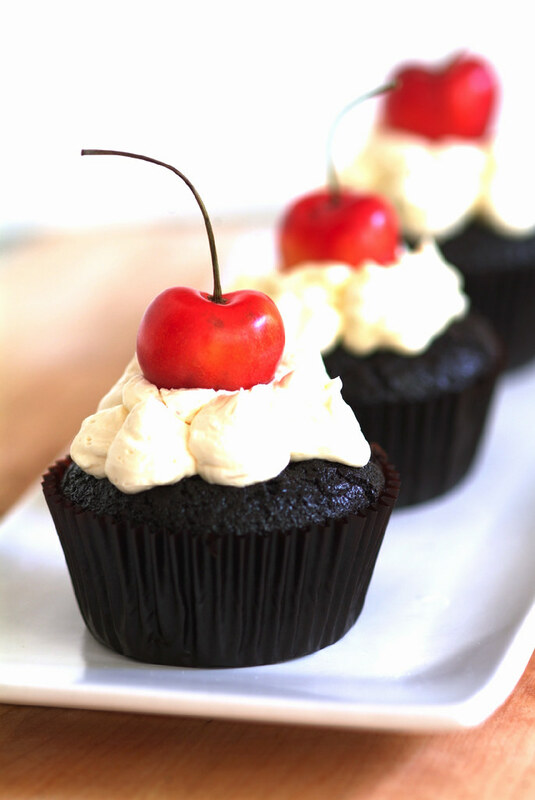 Top with a cherry, if using. 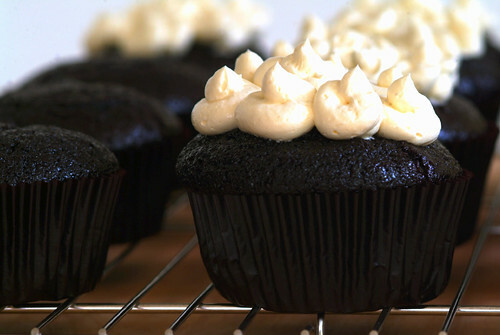 To keep cupcakes in a holding pattern while you assemble the remaining ones, you can put them in the freezer, but try to do so for no more than 5 minutes or the whipped cream will harden. 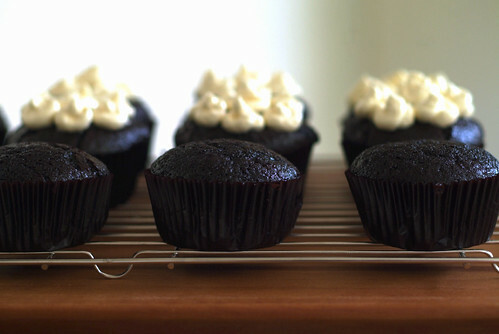 These cupcakes look scrumptious! I like the last photo; the frosting looks a lot like a scoop of ice cream. I'm sorry your whipped cream didn't turn out right in the mixer. You have to watch it as it goes. As soon as I seen lines in the cream, I watch intently and stop the mixer from time to time to look for almost stiff peaks. The process gets a lot easier after you are familiar with the signs that the cream is ready. 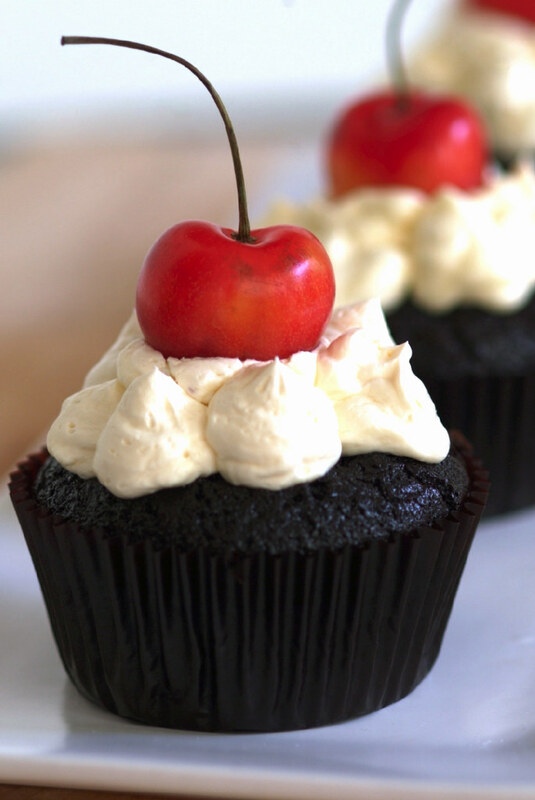 Memoria: That last photo is a cupcake with vanilla ice cream and whipped cream on top. Thanks for the whipping tips, I shall try it again soon! Hi, I love your blog! Particularly this piece of story. It reminded me of Julie Powell in Julie & Julia! Love the book and movie! Thanks Kylie, I love the movie, haven't read the book but I got Julia's life in Paris book! Can you share what brand of whipping cream you use and where to get it from? Stacy: I don't have any preferences. Usually I use Bulla from the supermarket near my home.